Bocina Portatil Skull Bluetooth, Usb. Envio Gratis! 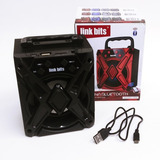 Bocina Bluetooth Marca Doss Recargable Oferta!!! !